A bog standard pub with cheaper Pride (4.05) than the nearby Royal George. But frankly I preferred the George for a flimsy personal reason; while attracting the same sort of transient customers, this place seemed to serve on sufferance whereas the George tried to provide a welcome. It's cheap, characterless but not too bad. You get what you pay for springs to mind, so what do you expect? The staff are always friendly, quick, efficient and polite – even when it’s ridiculously busy. Unfortunately last time I was here there were only 2 people serving and it took 25 minutes to get served, which was a first. The food isn’t bad, and there are always offers with both drink and food. With 9 screens it’s not a bad place to watch the football – so bring out the plastic glasses! There is also a DJ on a Friday and Saturday, but music plays throughout the week. Tuesday is always popular as they have major drinks offers, , but it can become a bit of a meat market as you seem to get the random lecherous men hanging around the ‘sort of’ dance floor – but then with the state of some of the women that happily invite it. I’m not surprised. Clientele varies from after work drinkers, students to passers-by but its always friendly enough. Used this place once and never will again. Mid afternoon, place was quiet, ordered food, was clearly an inconvenience for the glowering female-type thing behind the bar, drinks were slopped onto the bar a couple of yards from where we stood, food when it arrived was awful, greasy and cold chips, rubber burger, and a curry that looked like it had been eaten already. I had the cheek to ask for salt after hunting round all the tables nearby, the response was a snarled "it's all on the tables" when I politely pointed out that the pots were actually all pepper she slammed down the glass she was holding and stormed off, located salt from god knows where and banged it on our table as hard as she could. Needless to say we didn't stay, and didn't bother asking for a manager either, just knew there'd be no point. As we left, my partner poured the flat lifeless lager we'd been served into the curry, it made a nicely brimming plate of unspeakable looking slop. Good luck picking that up love! We never normally behave like that but hey, you reap what you sow. I personally like this pub. a meal and a pint for under a tenner in London is almost unheard of. I'm no snob and the people who frequent this place are generally very friendly and chatty. I always go here when i fancy a cheap pint and I'm in Euston. It won't win any awards for being trendy, that's for sure, but it's great if you just fancy a couple of cheap pints and a game of pool and a natter. Pretentious it ain't - it's just an honest to goodness pub. 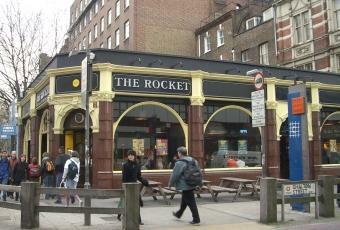 I finally managed to pay a visit to the Rocket yesterday evening. I wasn't overly impressed. The interior is a bit characterless apart from a fairly nice ceiling and a few interesting old pictures of London on the walls. No real ales are on offer. As with many pubs around here, it seems to attract a transitory crowd. During our visit, there were a few London Marathon runners presumably awaiting their train home. There are better pubs in the immediate vicinity.